Scientific basis. The ability of magnetic fields to stimulate nervous structures has long been known (93). Magnetic stimulation creates intense and brief magnetic fields, which, unlike electric currents, are only mildly attenuated by natural barriers such as skin and bone. They can therefore reach deep nervous structures, where stimulation is produced in situ by the electrical fields induced by the rapidly changing magnetic fields (Figure 10). The mechanisms of neural response to magnetic stimulation are different from those of the response to electrical stimulation (94-97), and therefore the results obtained with the two techniques may have different interpretations. Nevertheless, magnetic stimulation has the advantage of being relatively painless and is thus easily applicable in the clinical setting. Several review articles were discussed by Chokroverty (98). Figure 9. Technique for transcutaneous electric stimulation of the phrenic nerve. 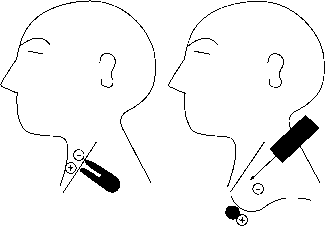 (A) Use of a bipolar electrode to locate and stimulate the phrenic nerve; (B) the monopolar technique. The phrenic nerve is usually found underneath the posterior border of the sternocleidomastoid muscle, at the level of the cricoid cartilage. The operator stands or sits beside (possible for unilateral stimulation) or behind (for bilateral stimulation) the patient and uses the electrode to push the muscle forward. Firm pressure on the soft tissues of the neck avoids changes in the relationship between the electrode and the nerve. During the last 10 years, magnetic stimulation has been extensively used to stimulate the central nervous system in conscious humans (99). From the respiratory point of view, magnetic stimulation applied to the cervical spine (CMS) elicits a bilateral diaphragm contraction (100). The coil is centered over the spinous process of the seventh vertebral body (C7), but this does not mean that the seventh roots are stimulated. Depolarization of a nervous structure by magnetic stimulation requires that the stimulating current and the nerve share a common pathway: centering a circular 90-mm coil around C7 would, thus, generally stimulate the third to fifth cervical roots (101-103), depolarized in their intraforaminal segment (104, 105). Although it is generally believed that CMS provokes diaphragm contraction through the stimulation of cervical roots, it has been suggested that the C7 CMS magnetic field may reach the phrenic nerves anteriorly, through the neck, and thus stimulate the phrenic nerve trunk at a point more distal than with ES (106) (Figure 11). Cervical magnetic stimulation also stimulates other elements of the cervical roots and nearby nerves, thus causing some contraction of neck and upper rib cage muscles, as well as diaphragm (100, 107-109) (see Comparison between Transcutaneous Electrical Phrenic Nerve Stimulation and Cervical Magnetic Stimulation). Methodology. The subject, comfortably seated in a chair, is asked to bend the neck forward slightly. The coil is applied to the back of the neck, its midline coinciding with the axis of the vertebral column (Figure 11). Optimal results are generally obtained with the coil centered around the spinous process of the seventh cervical vertebra (C7), but slightly higher and lower positions should be tried with monitoring of pressure or EMG, although care may be required to obtain satisfactory surface EMG signals. The optimal coil position may vary with the size and neck morphology of the subject. Stimulation intensity is generally set to the maximal output of the stimulator (see Supramaximal Stimulation). Figure 10. Schematic representation of the principle of magnetic stimulation. The electric current produced by the charging circuit is stored in capacitors. Switching on the trigger circuit results in a sudden pulse of electric current in the coil of wire held in contact with the patient. The intensity of this pulse of current can be modulated (from 0 to 100% of maximal intensity). A pulsed magnetic field orthogonal to the current flowing through the coil is produced. This magnetic field is able to penetrate body tissues such as skin or bone with little attenuation. It in turn induces secondary electric currents of low intensity in deep structures. If such a structure, for example, the cerebral cortex or the trunk of a peripheral nerve, lies at a tangent to the secondary electric currents, it is depolarized at a point that depends on the local geometry and on the intensity of the current. The intensity of the magnetic field induced within the tissues decreases with distance. The maximum magnetic field intensity produced by modern stimulators is around 2.5 Tesla. netic fields of 2-2.5 T with a medium-size circular coil, should be used. Doughnut-shaped coils 90 mm in diameter are particularly suitable for generating bilateral diaphragmatic contractions for the measurement of twitch pressure (100, 107-110). Advantages. Cervical magnetic stimulation provides easy bilateral PNS. it is not painful: The subject simply perceives a contraction of neck muscles that provoke an extension movement, and a hiccup-like sensation. Any operator reasonably familiar with medical or physiological tests can obtain reliable results after a brief period of training. The number of stimulations applied during a given CMS session is often lower than with ES, which reduces the risk of potentiation and the staircase phenomenon (see previous passages, and Twitch Potentiation, subsequent section). 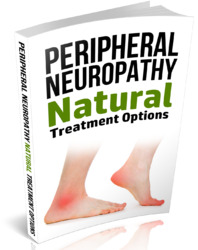 Location of the nerves is technically easier with CMS. The risk of falsely low results due to difficulty in locating the nerves and other technical problems is lower with CMS than with ES. in addition, because of its sites of action (cervical roots of the phrenic nerve [101, 103] or intra-mediastinal segment of the phrenic nerve ), CMS can activate diaphragm fibers innervated by an accessory or ectopic phrenic nerve (111) that would not be accessed by ES (112). Disadvantages. Cervical magnetic stimulation lacks the specificity of ES for the diaphragm, because of coactivation of muscles innervated by cervical roots or the brachial plexus. interpretation of Pdi,tw by CMS is, therefore, not exactly the same as that of Pdi,tw by ES (see subsequent section). Confirming supramaximal stimulation can sometimes be difficult (see subsequent section). Obtaining a reliable EMGdi signal is difficult with CMS, but technical solutions are available (use of shielded EMG cables, transient muting of the EMG amplifiers, etc.) (113) and modern EMG recorders are now designed to support magnetic stimulation. A reasonable distance should be maintained between the stimulating coil and credit cards, computer disks, and the like.